A true cowboy in demeanour, this Quarterhorse operates under the “no saddle, no problem” rule! At 8-years-old Cowboy is no stranger to showbusiness. This beautifully coloured gelding has been travelling and performing with Cavalia for 3 years now! It’s hard to say if Cowboy turned out the way he did because of his name or if he was born a cowboy at heart. In any case, his personality definitely fits his name. Cowboy looks like he just walked off the set of a western movie and found his way to the show. He can be easily distinguished from the rest of the team by his all-sorrel coat and a splash of white on the front of his head that shimmers like a diamond when he is frolicking out in the sun. A true cowboy in demeanour, this Quarterhorse operates under the “no saddle, no problem” rule! Cowboy is trained in Liberty, Cossack riding and trick riding.” About as rare as a modest celebrity, he is known by all as a Cavalia All-Star because of his abilities paired with his very kind and gentle side. In “The Nomads,” Cowboy shows off his Cossack riding skills with the other horses of the troupe. In this beautifully choreographed equestrian act, each horse and rider pair enters the stage performing stunts more daring than the previous team! Once assembled before the audience, the horses run in a large circle, surrounding the riders who pull off incredible stunts. There is nothing like watching someone lie face-up on top of a horse galloping at full speed, or go from sitting atop the horse, to underneath its belly, to sitting upright again. It goes without saying, there is enough adrenaline to go around! His rider, Névine and his groomer, Laura, both describe him as a sweet and cuddly horse. He loves getting attention and being scratched by anyone at anytime. Cowboy is very social with the other horses in the team, but he has a special connection with his stall neighbour and best buddy, Mikko. Check out this picture of best friends Cowboy, Mikko and the now-retired Leroy – running around during their 10-day stay on a local Californian ranch in between shows! Don’t miss Cowboy and the rest of the Odysseo team at their next show! 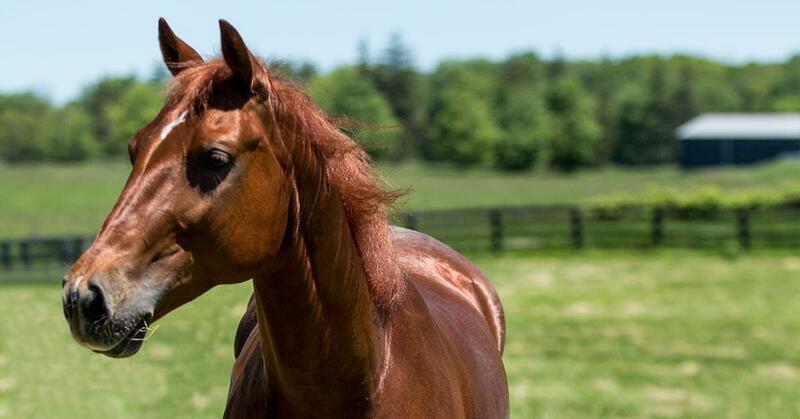 As for our retired horses, you can find out more about our Cavalia Horse Adoption Program here.